Lieutenant General James T. Stewart was commander, Aeronautical Systems Division, Air Force Systems Command, Wright-Patterson Air Force Base, Ohio. The division is responsible for developing and buying all Air Force aircraft, engines and atmospheric missiles. General Stewart was born in St. Louis, Missouri, in 1921. He graduated from Roosevelt High School there in 1938 and then attended the University of Michigan. In 1941 he enlisted as an aviation cadet and received his pilot wings and commission as a second lieutenant in the U.S. Army Air Corps Reserve at Brooks Field, Texas, in 1942. He received a bachelor of science degree in aeronautical engineering in 1948 from the University of Michigan. In 1960 he attended the Industrial College of the Armed Forces. In 1963 he received a master of business administration degree from The George Washington University. In 1942 General Stewart was assigned to the 116th Observation Squadron, Fort Lewis, Wash., where he flew coastal patrol missions in the early months of World War II. In the fall of 1942 he was assigned to B-17 transition training at Geiger Field, Washington, and became an instructor pilot. Shortly thereafter, he was assigned as a flight leader in a newly activated B-17 bombardment group which was sent to England in May 1943.
bombing missions against Nazi-held Europe. He returned to the University of Michigan in 1947, graduating in June 1948. General Stewart was then assigned to the Air Proving Ground Command, Eglin Air Force Base, Florida, where for the next four years he held key assignments in operational suitability test organizations. During his tour at Eglin, he helped pioneer techniques for long-range cruise control and dive-bomb delivery of nuclear weapons in jet fighter aircraft. In 1952 General Stewart was assigned to the Far East Air Forces Headquarters in Tokyo, Japan. There he helped establish requirements for war materiel, supervised local modifications of equipment, and was a key planner in the development of nuclear delivery capability of F-84 aircraft. During the last year of his tour he was the assistant deputy for operations, FEAF. In 1955 he was assigned to Headquarters U.S. Air Force, Washington D.C., in a research and development planning and programming capacity and, subsequently, became the assistant for development planning. General Stewart attended the Industrial College of the Armed Forces from August 1959 to June 1960. In 1960 he was assigned to the Air Research and Development Command, Andrews Air Force Base, Maryland, as assistant for programming, and later as assistant deputy chief of staff for systems when ARDC became the Air Force Systems Command. In 1962 he returned to Headquarters U.S. Air Force as executive officer to the deputy chief of staff, research and development. In 1963 he became the director of science and technology. While at Andrews Air Force Base and the Pentagon he attended night classes at The George Washington University. In 1964 General Stewart was assigned to the Office of the Secretary of the Air Force as the director, Office of Space Systems. In early 1967 he was briefly reassigned to the Air Staff as director of space. In March 1967 he assumed duty as the vice director of the Manned Orbiting Laboratory program. He was assigned as deputy chief of staff, systems, Air Force Systems Command, Andrews Air Force Base, Maryland, in August 1969, and became commander of the Aeronautical Systems Division, Wright-Patterson Air Force Base, Ohio, in June 1970. For his service during 1943-1945 General Stewart was awarded the Air Medal seven times and the Croix de Guerre. He also was decorated twice with the Distinguished Flying Cross. His many other awards include the Distinguished Service Medal, the Legion of Merit with oak leaf cluster, Bronze Star Medal, Air Force Commendation Medal, Army Commendation Medal, European-African-Middle Eastern Campaign Medal with six service stars, World War II Victory Medal, Korean Service Medal and the United Nations Service Medal. He is the author of "Airpower - The Decisive Force in Korea," a book published in 1958. A native of St. Louis, Missouri, General Stewart is married to the former Georgia Schwepker of Tacoma, Washington. They have two children: James T. III, a captain in the U.S. Air Force, and Kellie Anne, a student at the University of Florida. He was promoted to the grade of Lieutenant General effective June 1, 1970. 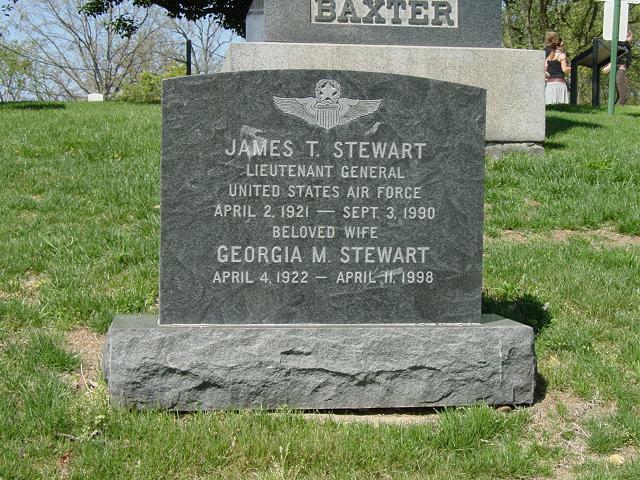 General Stewart was buried with full military honors in Section 2 of Arlington National Cemetery.